i was aboard a flight with my dad from Lagos to Abuja , I settled finally in my seat, to catch some real sleep. I had eaten, read the newspapers, but not quite ready to listen to any music. Flipping through the channels to see what to watch later, four documentaries about entrepreneurship and fatal mistakes made caught my eyes. One was about Coca Cola changing their recipe, the other was about a detergent manufacturer in the U.K adding too much chemical to bleach out dirt, a third was about Cadbury enticing school kids to buy more chocolate (in order to earn exercise equipment), and Dyson. 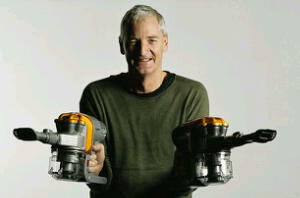 Even though I watched all of them, my message today is about James Dyson. James Dyson (born 2 May 1947) is a British industrial designer and founder of the Dyson company, and an inventor who has developed products that have achieved sales of over $6 billion worldwide. Among his earlier inventions are flat bottomed boats called Sea Trucks and ball barrows (wheelbarrows with a giant ball instead of wheels). More recently public restroom users have enjoyed Dyson’s Air Blade hand dryer. I find the story behind Dyson’s greatest commercial success, the Dual Cyclone bagless vacuum cleaner, to be the most interesting. James used the knowledge gained designing an industrial cyclone tower in 1978 to build a vacuum cleaner that would require no bag at all. The incredible part of the story is that this took Dyson 5 years and 5,127 (five thousand one hundred and twenty seven) prototypes to get it right. James could have given up at 5,126 prototypes or could have allowed discouragement to divert his attention, but he kept going. If you had to advise James Dyson early at his 1000th or 3,000th prototype, what would you have told him? Would you have advised him to continue, or give up?At 5,127 prototypes the Dyson Dual Cyclone became the fastest-selling vacuum cleaner ever made in the UK, outselling products from companies that had rejected his idea. The lesson, unless you have reached your destination of financial independence, you must keep going, keep re-inventing yourself until you succeed. The Dyson in you is waiting.